Situated in a 27-story tower with views of downtown Chicago and Lake Michigan, the Shirley Ryan AbilityLab is the first-ever “translational” research hospital where clinicians and scientists work alongside rehabilitation patients. Architectural firms HDR and Gensler, in association with CWa and EGG Office, tackled the $407 million project much like the AbilityLab staff looks at treatment: through collaboration. The new building, which opened in March, isn't the only transformation that took place though. AbilityLab is a rebranding of the Rehabilitation Institute of Chicago, which needed an upgrade from a 43-year-old squat tower that sat a few blocks away. The AbilityLab increased the number of beds from 180 to 242, with the potential to grow to 360. Most patients spend, on average, 24 days in the facility. During the rehabilitation process, it is important for patients to have access to quiet and active spaces, which are designed accordingly, Leiserowitz said. Private patient rooms are loaded with state-of-the-art technology, including customizable data and entertainment systems. And given a patient's length of stay, there are plenty of opportunities to add personal touches to the room. The active spaces include five ability labs—Think + Speak Lab, Legs + Walking Lab, Arms + Hands Lab, Strength + Endurance Lab, and Pediatric Lab—where patients work closely with clinicians and researchers. There are also private, so-called backstage spaces for planning and analysis. “The design is a reflection of that vision both inside and out,” said Dr. Joanne Smith, CEO of the AbilityLab. “Every inch of the building is designed for care and every inch is designed for research. The central goal: better, faster recoveries for our patients.” The AbilityLab's corridors have gentle curves for ease of movement, offering better accessibility to patients in wheelchairs or with physical disabilities. The staff want patients to see other people in the same situation who are improving, Leiserowitz said. The aesthetics—bright bold colors and graphic designs—are intended to inspire hopefulness. 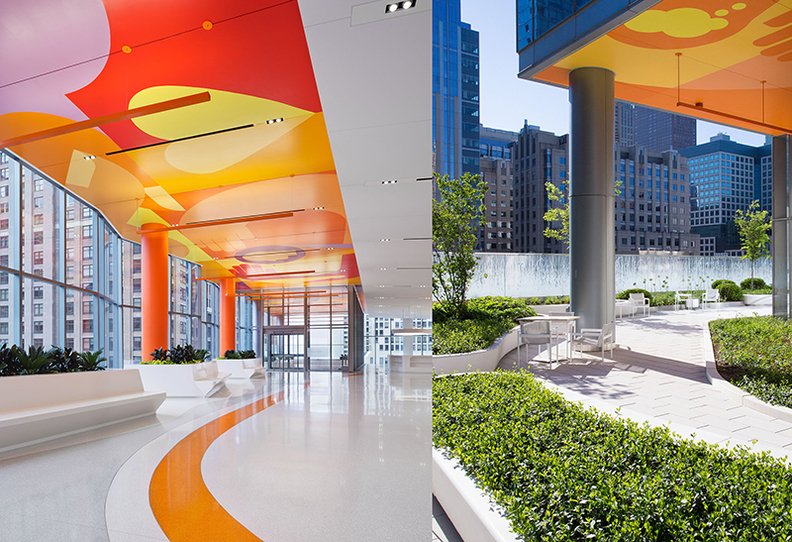 The architecture team also worked with CWa and design studio Egg Office to develop those dynamic graphics throughout the building, particularly on the ceiling where patients lying on their backs can see the designs. Design award judge Todd Robinson, of ESa, described the rehabilitation center as contemporary and radical, noting that the expressive graphics were used as a wayfinding method but also as a way to break up the monotony of space. “I think a lot of the reasons it was selected was the way it actually utilized the site in the most effective way and it utilized the graphics,” he said. HDR's Abigail Clary, who was the principal-in-charge of this project, added that “the graphics are what makes it sing.” The facility exemplifies the patient-centered approach, earning it top marks this year.